At colorFabb we have stressed again and again and again and again that it is more fun to print the things you need than to buy them. It is September 1st and for most of the younger colorFabb users it is back to school again. No worries, younger colorFabb users, this will change when you grow up: you will go to work instead of school. Anyhow, we thought it would be fun to print a few much needed things that are useful for everybody heading back to school: a drafting set and a pencil case. For these prints we used nGen, our all-round 3D printing filament made with Eastman Amphora™ AM3300 3D polymer. Both prints were printed with nGen on the Ultimaker 2+ at 0.2mm layer height. Temperature was 230 degrees C with the heated bed at 85 degrees C.
The protractor handle was printed with nGen Red, the print was stopped and we finished the numbers, etc. with nGen Black. Material of choice is our trusted nGen filament. nGen has proven itself to be a very versatile material that can be used for a lot of applications, visual prototyping being one of them! It has become our default, all-round filament for printing all sorts of prototypes and prints just have to look damn good! nGen is an all-round filament which has many advantages over PLA. The temperature resistance is over 80 degrees C and it works on most printers with a heated build plate. nGen is a low-odor, styrene-free material uniquely suited for 3D printing enthusiasts, particularly those who need the flexibility to print within a wide processing temperature range. With nGen you will have good flow properties through the printer nozzle—even at lower temperatures than some other polymers require. These properties make nGen more workable at a wider breadth of temperatures, producing reliable results and resulting in less waste. You can find more information on our dedicated landing page. Ever since launching in november 2015 (and later in a big way during the CES Show early 2016), nGen has been a bestseller and a material that has been adopted by users worldwide very rapidly. In a recent survey we have seen it is regarded as one of the most popular materials in our portfolio. This is not without reason. For instance, nGen Black has nothing but solid 5 star reviews and is on sale right now! (Sale occurs at the moment of publishing and only for a limited time). nGen is available through our webshop and our network of distributors and resellers worldwide. nGen is made with Eastman Amphora™ 3D polymer AM3300. It is part of our range of Amphora based filaments. 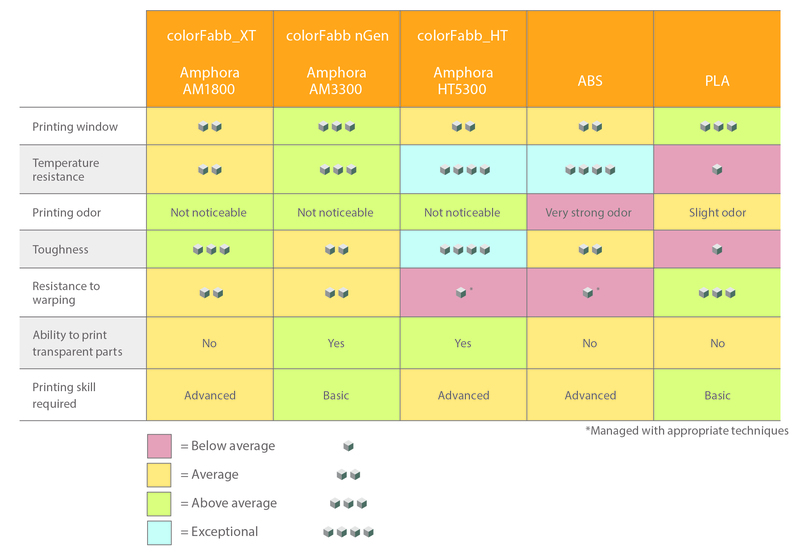 Other grades are: engineering grade colorFabb_XT, high temperature resistant colorFabb_HT and semi-flexible nGen_FLEX. With Amphora, items can be created that are more functional, more durable, more efficient, and attractive.